Explanations are where the actual learning happens in Yarno, so it’s an important investment of time to write good ones. A good explanation clearly and succinctly states the correct answer to its question, provides some context for understanding the question, but NOTHING more! It’s vital that you keep explanations as concise as possible. Going off on tangents or expounding unnecessarily will quickly lose your learners attention for both a single explanation and the entire campaign. Learners should be able to read and understand an explanation in less than one minute. Keep in mind that the other details of the knowledge you’re transferring will be addressed with the explanations of other questions. If you feel like you need to write a longer explanation to impart all the information that needs to be communicated consider breaking the explanation down into another question. Some overlap in explanations for questions about the same broad topic is inevitable, beneficial even. But we cannot emphasise enough how important keeping explanations directly relevant to their question is for maintaining learner engagement. It’s time to turn to all that material you filtered through. Start with one question. Pull out the relevant material for that question and read, watch or listen to it. As you go, write an outline of the key points that are needed to explain the answer to the question. This is basically your explanation. Once you’ve read the material and written your outline you’re ready to flesh it out with some snappy sentences. Write conversationally – Write like you would speak. Sure, grammar is important, but understanding is paramount. Tone, wit and a dash of humour make reading your explanations fun. Keep it short – Keep your words, sentences and paragraphs short. Minimal jargon – Using jargon in your explanations is a trap. It seems important, but if your learners are unfamiliar they won’t have any idea what you mean. More often than not jargon obscures understanding. Leave it out wherever possible. Explain acronyms – The same principle goes for acronyms: whenever possible trade them out for the actual words they stand for. But when acronyms are necessary, BSTE (Be Sure To Explain). Use of computing devices, together with the volume of information we consume these days, has changed how we read and how we write. Prolific bullet points – Bullet points help give a screen of text visual structure for the eye to track. Use them as often as possible. Frequent paragraph breaks – Long paragraphs are hard to tackle on a screen. Keeping paragraphs to one or two sentences will help make your content easier to read. Rich formatting to structure texts – Rich formatting is changing the look of text with headers, bullet points, numbered lists, bolding, italics and underlining. Use these to give your explanations organisation that will make them easier for learners to break down and digest. We also recommend using italics or bold text to indicate what part of an explanation directly answers the question. 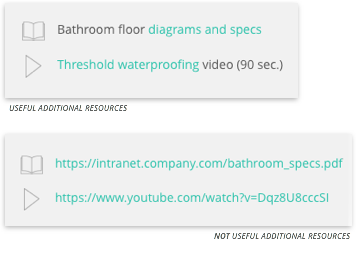 At the end of every Yarno explanation is a place where you can add links to additional resources from around the internet or your intranet. You simply select the kind of resource it is (text, video or audio), type the words you want the learner to click on and paste in the URL for the resource. The key here is what you type for the learner to click on: telegraph what benefit the resource has for them.